The Clique Hunter from Majestic just helped me find 125 new link opportunities that I have somehow managed to miss in a tight niche. I have been working for this client for around 18 months and our link building has been very successful and their traffic has grown significantly over the period but this was a stark reminder that it is necessary to diversify the tools that we use for linkbuilding. 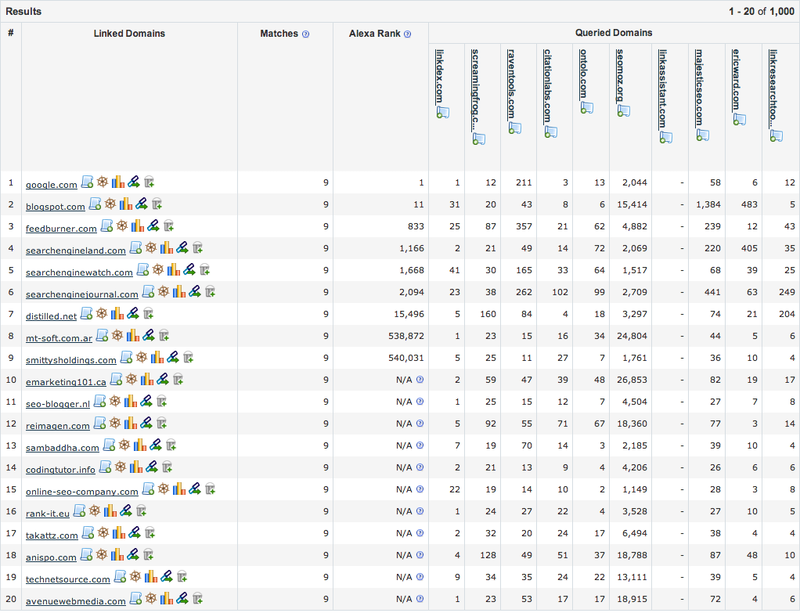 I have heard lots of great things about MajesticSEO over the years but never really given them a proper try. I actually went to use the site explorer tool today to run some more general checks on a few specific domains and stumbled upon the Clique Hunter. If you were to collect all of the links from every site in the SEO community there would be many links between the sites; I would be very surprised if the blogs and agencies listed above do not link out to any of the tools listed above. An important column in the report to look at is the “matches” column as this shows you how many of the 10 domains that you ran the report for are linked to by each of the domains featured. The report includes all domains that link to at least 2 of the 10 sites. The great thing about this report is how it so clearly gives you a picture of the link landscape for a specific industry. You cannot see it in this screenshot but there is the functionality to apply a number of filters right in the tool so that you can drill down to the most important sites. 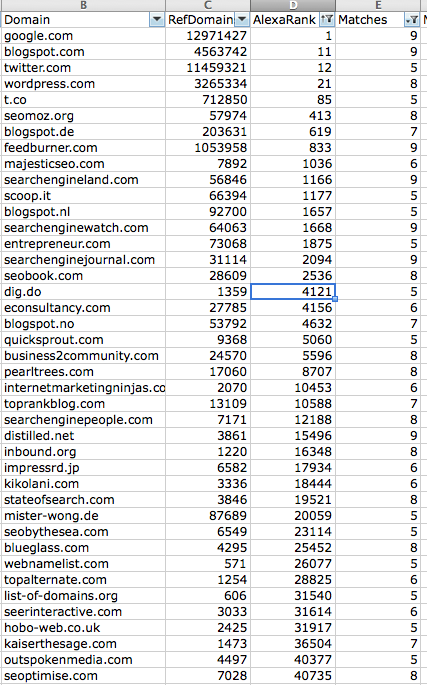 You can filter OR sort by the number of matches, the Alexa rank or around a dozen other metrics. I know that I would love to have all of these sites link to us so for the SEO industry I think that this is a pretty good example of some of the top blogs, news sites and agencies. Interestingly a number of the tools are here too. Particularly when you are new to an industry this is an invaluable analysis; whenever we pick up a new client we need a quick way to understand the landscape of the important blogs, industry news sites, tools, providers, directories, forums etc within an industry we look to a solid competitor back link analysis and this tool is the best I have yet found to fulfil this job. You get a large number of solid link opportunities. OK, so competitors’ back link’s may not exactly be the most creative of link building strategies but really this kind of analysis and link building is unavoidable if you want to become a significant player in your market. If you create a SEO tool then you want to be on the sites that people go to for reviews of tools or on the big industry blogs and forums and the chances are that the leaders in your market have a lot of traffic from the most relevant sites. I always find that this is a nice introduction to an industry and a good way to get a few quick wins. You may discover competitor sites or sites in the industry that have lots of links to them through this analysis so you can run a more detailed analysis of the links to each of the queried domains or alternatively the linked domains that you have uncovered. It is always useful to understand the link building strategies of your competitors as there are usually variations of the same strategy that you can employ yourself. For example; we recently did an analysis in the business insurance space where we found that a site had build a very large percentage of their links through encouraging their clients to put a proof of insurance badge on their site which links to a certificate on the insurance site to help the bade wearing site with the trust of their customers. Regardless of how Google treat this kind of link it will bring a lot of referral traffic through and as far as we could see it did support search rankings too. How this is executed could be varied – it could be a widget that includes some industry news (assuming link targets are within a single industry) as well as the badge so that it gives some added value to the website owner. Most sites I have analysed have 3 or 4 active link building strategies that they employ and the rest happens naturally; the idea is that over time the “happens naturally” takes over, as is the case for market leaders like SEOMoz. In the meantime, understanding what all your competitors are doing is a good source of creative linking strategies as suddenly a lot of your assets become strangely visible. Great post, and thanks for sharing… I was the same I mainly used Open Site Explorer for backlink opps, and never fully took advantage of Majestic as much.